Talofa lava. (Hello to you). Sit up and listen! 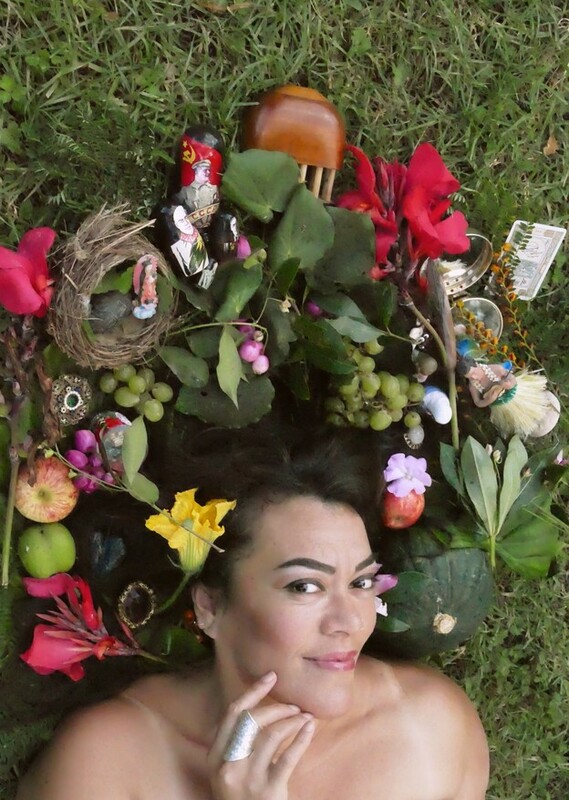 The poetry of Tusiata Avia demands that you do, whether you are reading it in book/online form, or more especially if you see her perform her work live. Check out also the links to her delivering on YouTube, as listed below this commentary. Before I write more, let me provide a bit of background information about Tusiata. Tusiata lives in Christchurch [New Zealand]. She has published three books of poetry, including Wild Dogs Under My Skirt and Bloodclot, and three children’s books. Known for her dynamic performance style, she has also written and performed a one-woman show, also called Wild Dogs Under My Skirt. In 2016 it became an award- winning play for six women. Tusiata has held a number of writers’ residencies and awards, including the CNZ Fulbright Pacific Writer’s Fellowship at University of Hawai’i and the Janet Frame Literary Trust Award. Fale Aitu | Spirit House was shortlisted for the Ockham NZ Book Awards in 2017. Let me also add that Tusiata is not a ‘maintream,’ as in comfortably white middle-class, writer: far from it — which is also, of course, why I feature her here in these Jacket2 commentary posts, designed to draw out the ‘vitally different’ in New Zealand poetry. An especially revelatory interview with her in e-tangata online during 2015 is well worth reading. This interview backgrounds her own lifelong struggles and efforts to depict, to catharsise such struggles via her never-afraid-to-be-honest work, in a country never easy to live in for its steadily increasing nonwhite population. More, in Samoan, Tusiata means artist. She is, indeed, very much a word artist extraordinaire. The Kiwis on the colonial promenade pier talk about senior cruises: Tahiti first or Hawai’i? Which is the best way to do the Pacific? The black body flaps its arms on the colonial promenade pier, flaps and flaps and flaps. There is no rise off the colonial promenade pier. Arms flapflapflap. There were whales that passed through this water but they are now in storage in Japan. The seniors talk about going to Japan to eat whale: Well, they’re running out of storage space for whales, aren’t they? Here are her responses to my questions. I tend not to know what I’m doing until after I’ve done it. A more intuitive approach works best for me: writing my way into something, writing to find out what is there — then the themes, devices etc emerge. Although having said that, I like using poetic forms — something to rein in all that free-writing, give it some structure. And I do many drafts of each poem. I’ve always been interested in using non-English words in my poetry; Samoan obviously, but other languages too, like Arabic. I’ve also been mining Samoan myths and legends for years now. I refer to them the way a ‘mainstream’ Pākehā poet would the ‘Classics.’ These references resonate across the poem and the book and my body of work. If they were references to Oedipus or the Trojan wars the audience would know who/what I was talking about and get all the nuances. I’m a pretty generous writer in that I provide a decent glossary but you can only explain so much that way, so, I have to be content that it’s satisfying for me and the handful of people who read my work and know/research those myths and legends. What would you like to see more of in Aotearoa poetry from your point of view as a poet? In other words, is there sufficient recognition, publishing scope, critical space given to poets who craft their work in ‘different’ ways …? In the context of my last answer — that would be a no. Aotearoa is still very firmly entrenched in the mainstream. And what isn’t mainstream is still othered. I’m not saying there’s no progress but there are still too many Trojan wars and not enough Samoan/Chinese/Somalian/LGBTI legends. We may be able to point to a smattering of diversity, but before the literary establishment gets carried away with patting itself on the back for inclusivity and diversity, we need to be aware that their understanding to fully appreciate the work (particularly for the reviewers and people that write about and make decisions about us) isn’t there yet. Literary criticism is still dominated by straight white middle-class people who have few other lenses to view poetry through but straight white middle-class ones. [Rapatahana stress]. What are you working on these days, as regards writing, please? I’ve been making very slow progress on a novel, working on a new collection of poetry, rewriting the stage version of WDUMS for 2018–19 seasons of the six-woman play, and a little children’s writing. his weight doesn’t change the balance at all. Thank you for being on the significant edge of the slowly deconstructing inside that is Aotearoa New Zealand poetry (although some will say you are right at the contemporary centre. You should be too.) Thank you for your bravery writing about issues that need to be addressed, your candour in addressing these issues, your writing style(s), which reflect your significant alternative voice.